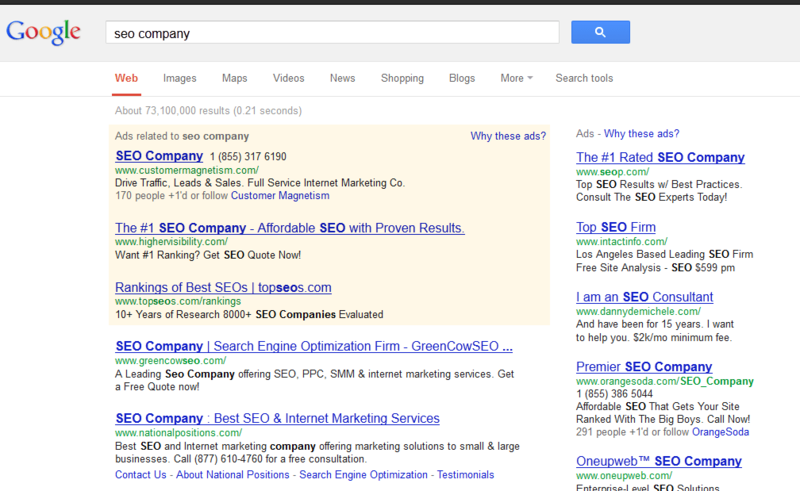 SEO Related Keyword’s Get a Local Feel to It. Interestingly enough Google has finally followed suit with local results for the keywords “SEO Company” and search terms related to search engine optimization. It used to be that if you typed in that keyword companies from all over the US would show up whether you are in Los Angeles or NY. Google has been really good at showing local results for other keywords specifically in the service industries, but never for SEO related terms. Now if you type in the keyword “SEO Company” and you are within the Los Angeles area you will mostly see SEO companies based in Los Angeles. You will see 7 out of the 10 results to be based within the geographical region. The result is less traffic for SEO Companies and less inbound leads nationally. If you like the idea of choosing a local SEO company your best bet is still to include the city or state that you are in within the search to get the best result. For instance if you type in “SEO services” in Google and you are in the Los Angeles area you will still stumble upon the company Mainstreet Host who is located within NY. It is crucial to check your keywords on a monthly basis to see how Google is affecting your industry and figuring out how to stay ahead of the curve.